The South Place Ethical Society, based in London is thought to be the oldest surviving freethought organisation in the world, and is the only remaining Ethical Society in the United Kingdom. The Society began in 1787 as a congregation of nonconformists known as Philadelphians or Universalists who opposed the Christian doctrine of eternal hell. By 1793 it had its first premises in Bishopsgate and in 1824 (under the minister William Johnson Fox) the congregation built a chapel at South Place, Finsbury, London. The Society occupied the chapel for 102 years. 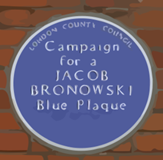 The name is still commemorated in the title of the Society, although it moved from South Place in 1926 to build Conway Hall, its present home in Red Lion Square which was opened in 1929. 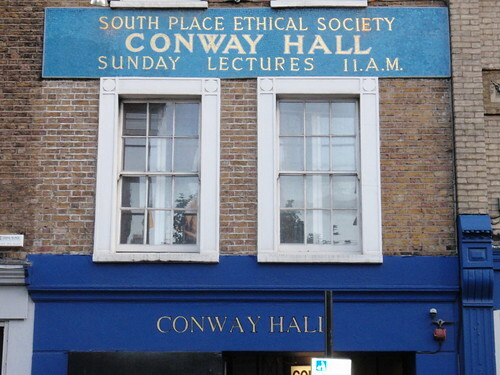 Until the opening of Conway Hall, the Society had 200-300 members. But, since then, the Society has gradually grown in size. The Hall was named after Moncure Conway, an American who adopted an uncompromising anti-slavery position at home and came to England in 1863 on a speaking tour. He settled at the South Place Chapel from 1864 until 1897, except for a break of seven years (from 1885 to 1892) during which he returned to America and wrote his famous biography of Thomas Paine. During that interval, in 1888, under the leadership of Stanton Coit, the name South Place Religious Society was changed to the South Place Ethical Society. The year 1887 saw the birth of the South Place Sunday Concerts of chamber music?–?at a time when it was very daring to hold any kind of secular entertainment on Sundays. This series was destined to reach such a high standing in the musical world and has now numbered more than two thousand concerts, its 2000th concert being held in March 1969. The first official organ of the Society was the South Place Magazine which flourished from 1895 to 1909, and, like the present journal, consisted largely of summaries of the Sunday discourses. On the magazine‘s demise for lack of funds, its place was taken by a less ambitious publication called simply the Monthly Listswhich gradually gained sufficiently in size and importance to justify a change of title in 1920 to Monthly Record. The latest change, to Ethical Record, was made at the beginning of 1965. Today, the Society is an educational charity whose aims are the study and dissemination of ethical principles based on humanism and freethought, the cultivation of a rational and humane way of life, and the advancement of research and education in all relevant fields. The Society is a member of the Humanist Liaison Group, along with the British Humanist Association, Camp Quest UK, the Council of Ex-Muslims of Britain, the Gay and Lesbian Humanist Association, the National Federation of Atheist, Humanist and Secular Student Societies, and the Rationalist Association.